Fashion shows are odd and very complex events that have a specific function in the fashion mechanism. For an outsider, watching a fashion show can be a confusing experience. Some designers are very focused on creating garments that can be bought straight off the runway, nice and straightforward. Other designers present fantastical garments and unwearable-looking creations, spectacles in cloth and embellishment, in which case the purpose of these outfits can be less clear. What no one says out loud, but everyone knows to be true, is that catwalks are not about wearability and sometimes even less to do with the garments, as it’s all about seduction. It’s a commonly know fact in the industry, that most dresses certain luxury brands like Alexander McQueen showcase on the runway, have an afterlife only in fashion editorials and one-off red carper events, never in the shops. 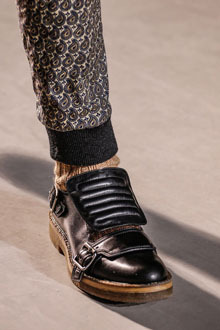 They are mere props in the theater of fashion, but despite this their purpose is integral to the industry and this is easily quantifiable in figures. Look at the end of year earnings for any big luxury brand and you’ll see that the most often the garments only make a single digit portion of the profits as the best part of the income comes from handbags, fragrances, cosmetics, sunglasses and shoes. If the garments are not in the show to be later sold, they are there to sell the rest of the stuff and add to the allure of brand. In general, I don’t allow myself to be seduced by catwalks. I’ve got zero interest in figure hugging dresses, flamboyant tuxedos or fantastical ball gowns, as I don’t really see the relevance of these garments in my life or modern society in general. I’m certainly not an advocate for fashion for fashion’s sake, which is the category these things most often belong to. Though an aesthete at heart, my approach to fashion is very utilitarian. I place importance on both the look and function of clothing and I don’t allow myself time to dwell on looks that seem unrelatable, unwearable and irrelevant, though they do make my job as a writer sometimes too easy if I feel mischievous. Hence I’m somewhat embarrassed to admit that something recently caught my eye that transported me into the fantasy realm of fashion despite the fact that I wish to see no one actually wearing this particular outfit. Antwerp born and based fashion designer Dries van Noten, is one of the outstanding designers working today who receives far too little praise. His collections are consistently relevant in terms of fashion, but never fashionable for fashion’s sake and he achieves making garments that are loaded with interest without making anything overdesigned. 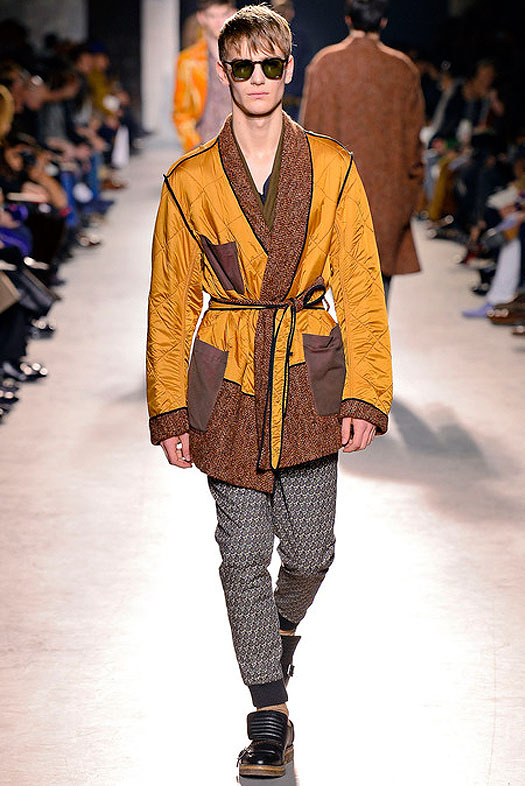 Whilst most other designers just make models on the runway look as if they are trying too damn hard, van Noten manages to style everything to appear nonchalant, mirroring the way in which women and men seem to want to dress today. His philosophy is that everything he puts on the runway, has to be able to go straight into shops and in general, I would be willing to buy everything. Everything, except look 26 from his a/w 2013 menswear collection presented in Paris this January. The overall outfit is loaded with historicism, which in design terms is rather lazy. The over-the-top flamboyance and peacock-ery that this outfit represents, doesn’t seem relevant for most men – give or take few eccentrics. On paper, I loathe everything that I see in front of me, but in reality, this outfit transports me into the fantasy realms of fashion. Whether literal deconstruction of garments like with the case of the jacket, or metaphoric undoing of fashion and its ideals, Dries van Noten is a master of subversion. Unlike ball gowns and other outfits targeted for the red carpet and editorials where the purpose is always to be seen, though outrageous in style and in its demands for attention, this outfit says something very different. 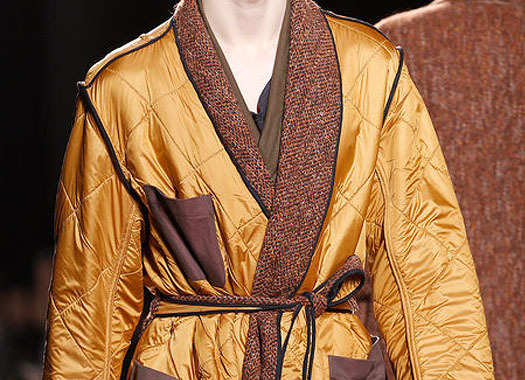 The smoking jacket conjures up associations of the exotic but also notions of home and thus comfort. It transports me into a place that feels familiar. Perhaps there is something in the air, which is why shows like Downton Abbey are proving to be so popular now, reminding us about established codes of dressing against a backdrop where no codes seems to exist anymore. And there is something to be said about the function of fashion it highlights, where dressing well, even is it’s just for staying at home, can become an event done for ourselves, not for everyone around us. It’s the connotations it has that contradict everything catwalk fashion is about that I respond to about this look 26 that is the antithesis to sloppy, careless things worn at home. Of course, I’m not buying into any of this, merely dreaming. Fashion is powerful in evoking fantasy; it is a machine for seduction. The magazines, the show producers, the models, the stylist and the rest along with look 26, all function within this gigantic steamship of an industry ultimately set to sell stuff, which is the fuel to keep the engines turning. No matter how hard I fight against it, I can’t help but be allured by fashion and fantasy every once in a while despite my Scandinavian yearning for practicality and function.